Major General Anthony "Tony" Joseph Drexel Biddle, Jr.
Major General A. J. Drexel Biddle was born in Philadelphia on December 17, 1896, the son of the late Colonel (United States Marine Corps) and Mrs. Anthony Joseph Drexel Biddle. General Biddle served in the United States Army in 1917-1918 with the rank of Captain. He enlisted early 1917 in Squadron A,Cavalry, New York National Guard. Later in 1917, commissioned as a 2nd Lieutenant. He served with various units. Promoted to Captain in 1918, he was Aide-De-Camp to Major General Grote Hutcheson of the 14th Division. He did not serve overseas at that time. He was engaged for a time in the shipping and radio broadcasting business; later reported on police systems in a number of European countries in cooperation with the director of the Federal Bureau of Investigation. From 1931-1934, he engaged in mining in South Africa. He was appointed Minister to Norway in 1935, and served in that capacity until 1937, when he became Ambassador to Poland. He accompanied the Polish Government when it was forced to move from Warsaw to several capitals in Poland in 1939 and later to Angers, France. He became Deputy Ambassador to France in 1940, when the French Government moved from Paris to Tours, subsequently to Bordeaux. He served as ambassador extraordinary and plenipotentiary of the United States to the governments of Poland, Belgium, the Netherlands, Norway, Greece, Yugoslavia, and Czechoslovakia and as minister extraordinary and plenipotentiary to Luxembourg from 1941 to 1944. Margaret Atkinson Loughborogh married Biddle in 1946 while he was serving with the Canadian Army on General Eisenhower's SHAEF Staff in 1946. She was Biddle's third wife. 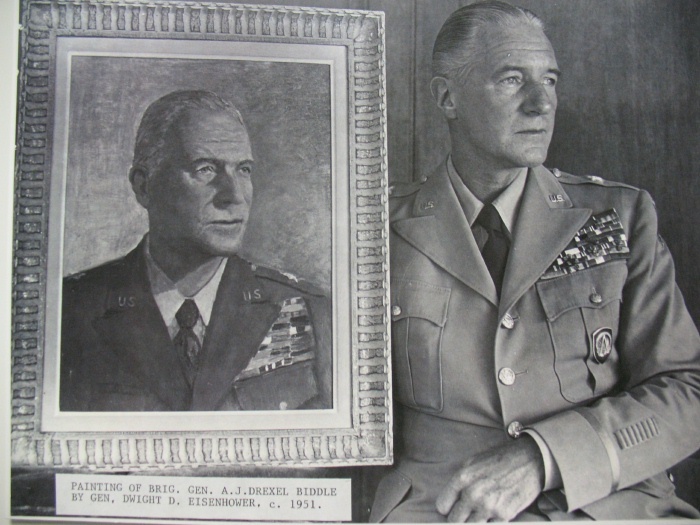 General Biddle entered the United States Army after he retired from the diplomatic service on January 24, 1944. He was promoted to the rank of lieutenant colonel in January 1944, colonel in May 1944 and brigadier general in March 1951. He saw duty as deputy chief of European Allied Contact Section, SHAEF; later as chief of Allied Contact Division, Headquarters, USFET; and Headquarters, EUCOM, successively. From April 1950 to January 1951, he served as foreign liaison officer, Department of the Army. From January 1951 to July 1953, he served as executive to the National Military Representatives, SHAPE. He served as special assistant to General Matthew B. Ridgeway, Chief of Staff, United States Army, from August 1953 to April 1955. On April 18, 1955 he reverted to inactive status, United States Army Reserve. On April 20, 1955, he was appointed Major General and federally recognized Adjutant General of Pennsylvania on May 17, 1955. General Biddle was married and resided at Indiantown Gap Military Reservation during his appointment. He resigned as Adjutant General on April 4, 1961 to become Ambassador to Spain. General Biddle passed away on November 16, 1961 at the age of 64. He died at Walter Reed Army Medical Center due to a heart attack while he was undergoing treatment for lung cancer. General Biddle was given a full military funeral at Arlington National Cemetery and is buried at Section 30, Site 1172-LH.